I love log cabin quilts. There’s something so simplistic and classic about them. They always look gorgeous when they’re complete, and they don’t take much time or skill to make. It’s great for beginners! So great, in fact, that a lot of people can do it with very little instruction, but since this is a DIY website, we definitely are going to give you a little help with this. Let’s get started! When you’re an avid quilter, you’ve definitely done a basic log cabin quilt before. If you haven’t now is your time, because Laura Ann Coia from SewVeryEasy has a tutorial! Not only that, but you won’t be using much other than some strips. What could be easier than that? Nothing, I tell you. Nothing. To get started, you’ll want to grab some strips that you feel go together well. The design builds at an angle with different colors, and it’s an easy fix to get them the way you want them. 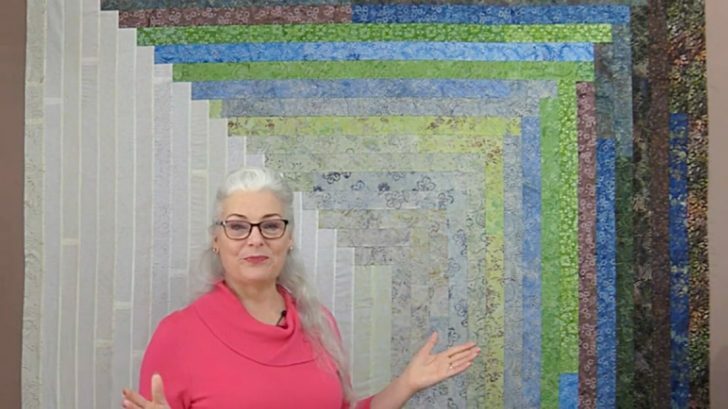 You can either start with strips all of the same size and sew them together or on a background. No matter what method you decide to take, the outcome it relatively similar. Watch Laura Ann Coia’s video below and get started on your own. It’s so easy, I could practically do it in my sleep!